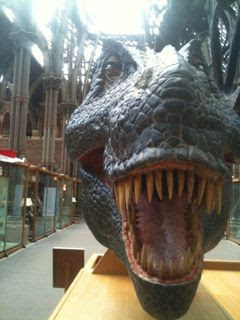 Visiting Oxford to talk about dinosaurs and detectives at the Oxford School's Bookfeast was a treat on so many levels. Not only did I get to visit this beautiful city in the sunshine and have a little wander among the dreaming spires, recalling my own student days here many, many years ago (glimpsing grim-faced students heading in and out of the exam schools in their gowns and black and white 'sub fusc' sent a jolt of nerves through my stomach even now!) but I also got to speak in the magnificent venue of the Oxford Natural History museum - a soaring glass-ceilinged cathedral of a building, stuffed with amazing exhibits - including dinosaurs like this superb T-Rex. My workshops were not in the main hall itself (fortunately, as it had heated up like a giant greenhouse) but in a seminar room off to one side that was full of the most wonderful array of objects - it felt like being in the laboratory of an eccentric Victorian scientist. I noticed a stuffed badger, a stuffed mountain lion, an octopus in a jar, giant grubs jars, a life sized human skeleton, a jar of sand in jewel-coloured layers, not to mention the fossils and casts that had been brought in specially to help illustrate my talk - including a giant mammoth leg bone (complete with the marks of a stone age axe - how cool is that?) and a plaster cast of a the very megalosaurus jaw I was talking about . . . But even better than all these marvels . . . all the fantastic people I met on my day in Oxford; the organisers, the stewards, the museum staff, the teachers, but most of all the pupils. So here is a big shout-out to all the lovely Y6 pupils at St Barnabas and East Oxford Primary Schools. It was an absolute pleasure to chat with you all about megalosauruses, coprolite, mammoths, clues, red herrings, baddies, mysteries and much, much more. In the morning session we got so carried away discussing the ins and outs of cloning mammoths (and maybe people!) from their DNA that we didn't have time to play the dino-naming-and-drawing game. In the afternoon, we added a bit more time on the end so East Oxford Primary discovered two new species. 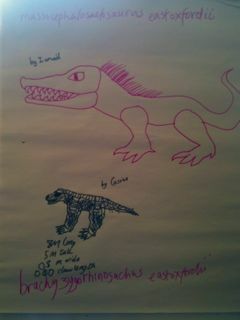 Here they are in all the spectacular glory as drawn by Ismail and Cassien.